Super Savings Item! Save 34% on the Hycles Sleep Mask with 3D Angel Eye Labeling & Ear Plugs No Nose Pad Eye Mask Ultra Soft Sleeping Blindfold Adjustable Strap Eyeshade for Men Women and Kids (Green eye) by Hycles at Kids Grooming. MPN: 6908923135455. Hurry! Limited time offer. Offer valid only while supplies last. Hycles 3D Sleep Mask - The Great Choice For Sleeping Have you ever struggled to fall asleep with bright lights and natural sunlight kept you awake? Have you ever struggled to fall asleep with bright lights and natural sunlight kept you awake? Our 3D sleep mask can relieve your pressure, insomnia, migraine, and give you the best sleep environment all night. and thickens canthus in order to ensure the great comforts of your eyes and nose. ✔ Comes with a pair of noise cancelling earplugs to ensure you enjoy uninterrupted, deep, restful sleep. ✔ The super soft material makes you feel more restful and no sense of pressure exists. ✔ The deep eye contour never touches your eyelid / eye makeup that you can blink your eyes freely. 1. Please hand wash with light detergent. 2. Don't dry it in dryer or microwave oven. 3. Don't wash it in hot water. 4. Please fold it up after using and keep it clean. We will provide 30 days full refund guarantee and friendly support, We guarantee the strength and durability of all our products. Our seller warranty guarantees that your purchase is 100% risk-free. We are committed to 100% satisfaction of our customers. If you find any problems with the product, please send us a email at any time. We will respond to you in time. Invisible Nosewing: Flat nosewing design, no nose pad, it is easier to fit the face, will not leak and the shading rate is higher, so as to achieve better quality of sleep. Modern 3D tailoring techniques also guarantee eye comfort without creating a sense of oppression. Unique 3D Lablleing Eye Design: Five designs for you to choose. The Cool Eye is made by special crafts Labelling, not priting pattern. Unlike ordinary printing 3D pattern, so it can show real 3D effect, and will make your sleep mask more attractive and unusual. 3D Contoured Block Out Light Perfectly: Human engineering contour can improve 99% lightproof performance and reduced 95% pressure. 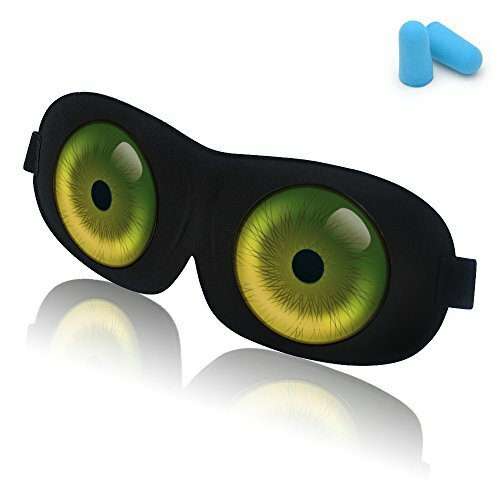 3D eye cover, covers your eyes fully, you can open and blink your eyes freely when you wear this sleep mask. Flexible Adjustable Strap: Softening elastic material, fits all sizes head comfortably with adjustable buckle and strap, we have lengthen the strap to increase the adjustable range to fits all size of head. The strap is high elastic and will not tangle or catch your hair. Breathable & Durable: Polyster material, two-sided fabric is seamless stitch by hand, stable sewing not easy to fall apart. Light and breathable material and smooth fabric let you get a good sleep and it is perfect for travel, naps, yoga or meditation. If you have any questions about this product by Hycles, contact us by completing and submitting the form below. If you are looking for a specif part number, please include it with your message.